Shitomae Sakaime Bansho was a barrier or checkpoint established by the Date clan. 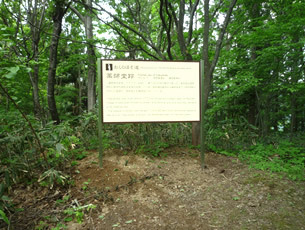 The grounds measured 44 by 40 ken, and covered an area of 1,760 tsubo. The premises were surrounded by an earthen wall built on a stone-faced embankment, and comprised ten buildings including a gatehouse, keeper’s residence (with an area of 187 tsubo), stables and storehouses. The checkpoint was the center of the post town of Shitomae. Goods and people traveling through the barrier were checked rigorously. Matsuo Basho describes how he and Sora were “eyed with suspicion by the barrier keeper and passed with difficulty” on the occasion of their 1687 visit. Since ancient times, this place was known to have had fencing demarcating the provincial border. Yusa Jinnojo, who held the office of kimoiri at the village of Naruko, recorded in his 1782 Iwate no Seki Yuraisho that traces of palisades dating from when Fujiwara no Hidehira’s forces took up positions at Jingamori were still clearly visible. A bansho (checkpoint run by the domain) was built at Shitomae probably around 1670, judging from Osakaime Oshioki, a related law promulgated by the Sendai Domain. 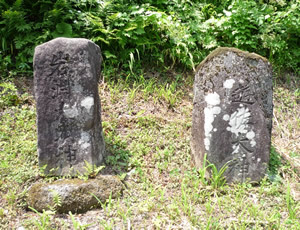 Because archives of the Date family in Iwadeyama mention the office of “Shitomae barrier keeper,” the post was most likely held by members of the Date clan. 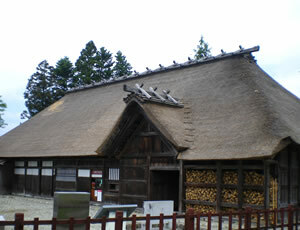 Upon arrival at Mutsu Province, Yoshitsune and his companions spent their first restful night in a long while at the barrier keeper’s residence at Shitomae. Here they were treated to local delicacies and were taken to nearby Kawarayu hot spring. Yoshitsune’s wife Kita no Kata was particularly pleased with the hot spring, and took baths both morning and night with her new-born son Kamewakamaru. The party decided to extend their stay to help Kita no Kata recuperate after childbirth and also help everyone else recover from the long journey. Benkei was charged with rowing the boat that took Kita no Kata and Kamewakamaru to and from Kawarayu every day, and this means of transportation gave rise to place names such as Funawatari and Funahiki, which were formerly in use at Kaminaruko. The hot spring enjoyed by Kita no Kata is believed to be today’s Ubanoyu. Kita no Kata reputedly said after giving her baby a bath that “the baby cried for the very first time when I told him that he could cry without fear of anyone hearing, now that he was safely in the domain of Fujiwara no Hidehira.” This is how the hot spring earned its name Nakiko (lit. crying child). The hot spring at Semi was in turn called Nakazu (lit. non-crying) hot spring. Yakushido was built before 1772 to house the tutelary deity of Naruko Village. 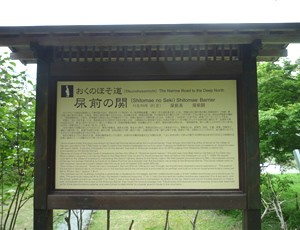 It was later moved to Onsen Jinja Shrine, and only the hoju remains at its original site. 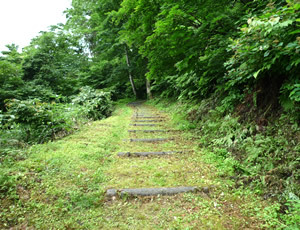 The steeply inclined road (length: 1 cho 55 ken) from Shitomae Sakaime Bansho to Yakushido is known as Shitomae-zaka or Yakushi-zaka. The highway had heavy traffic and was of high military importance because it was not only the shortest route between Taga Castle and Akita but picked its way through the lowest parts of Mutsu and Dewa Provinces. Military camps were set up at Ofukazawa during unrest in the Ouu region in the middle ages. At the time of the Boshin War in 1868, Sendai Domain forces were headquartered at Shitomae, and they also had guard posts set up at Kofukazawa, Ofukazawa, Nakayamashuku, Jingamori, Sekisawa, Ushusasamori and Mukaimachi. One of the five post stations or post towns of Tamazukuri (Iwadeyama, Shimomiya, Kajiyasawa, Shitomae, Nakayamashuku), Nakayamashuku was established in 1625 by the efforts of Yusa Heihachiro and his son Heiemon, who held kimoiri and kendan offices at Shitomae, Naruko Village. 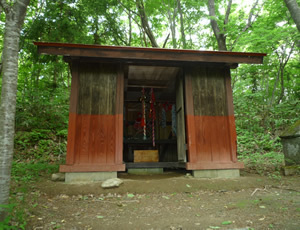 The kendan was situated at Nakayamashuku as well. 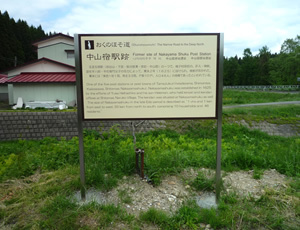 Yusa Heizaemon, who held the offices of kendan and kimoiri at Shitomae, Naruko Village, organized a project to dig a 1,331 meter-long irrigation channel to draw water from Higashitosuzusawa to newly cultivated land in Minamihara, situated on a tableland. The project took 19 years before its completion in 1658. Yusa Heizaemon was deified in the late Edo period, and a monument was erected in his honor. 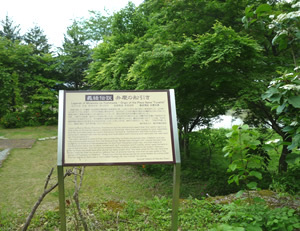 A monument dedicated to Iwabuchi Daimyojin was also erected at around the same time. Yoshitsune’s party arrived at Nakayamashuku Village after spending the night with the monkeys at Jingamori. When the party learned that Osen, wife of local charcoal maker Genzo, was having a difficult birth, Jyurogonnokami Kanefusa, who had assisted Kita no Kata give birth at Kamewari Toge, offered to help the delivery. Benkei fashioned a chestnut branch into a monk staff, faced himself toward the pure land in the west, and offered prayers to Guanshiyin, the most compassionate of the bodhisattvas. Thanks to their help and prayers, Osen safely gave birth to a girl. Genzo and the villagers wept in joy and thanked Yoshitsune and his companions. 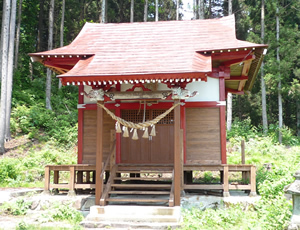 To share the blessing, villagers later built a shrine dedicated to Benkei’s chestnut staff. The shrine building is relatively large among those in Nakayama. In olden times the shrine’s annual festival was held for three days and two nights and featured sumo matches as well as kagura music and dancing. To this day it is revered as a tutelary shrine of expectant mothers, and it is customary for mothers of pregnant daughters to visit the shrine during the pregnancy to pray for a safe delivery and to return to the shrine to offer thanks after the birth. In 1187, nightfall forced Minamoto no Yoshitsune, who was journeying to Hiraizumi, to spend the night at this spot. Yoshitsune was accompanied by Musashibo Benkei and Kita no Kata, who had recently given birth to Yoshitsune’s son at Kamewari Toge at Semi. A troop of wild monkeys learned of the party’s plight and built a structure to shelter them, where the monkeys also treated them to amazake (a drink made of rice). To thank them, Benkei dedicated a statue of Jizo (Ksitigarbha) and prayed for the protection of the monkeys. Hojin-no-Ie means a border guard’s house. 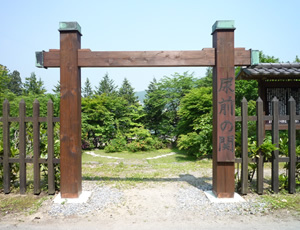 It is thought that the “Hojin-no-Ie” mentioned in Matsuo Basho’s The Narrow Road to the Deep North is the house of the headman of Sakaida Village in the Shinjo domain, located on the border with the Sendai domain, i.e. the former residence of the Ariji Family. 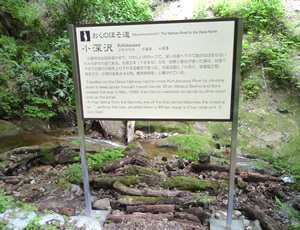 On May 15, 1689, Basho and his disciple Sora crossed the Shitomae-no Seki barrier in the Sendai domain and were hurrying to Dewa Province. However, it was already getting dark. He wrote in The Narrow Road to the Deep North: “As we climbed a high mountain, it had already gotten dark. We found Hojin-no-Ie and begged to stay for the night. Due to strong winds and rain, we were detained for three days in a thoroughly cheerless place.” The resulting haiku is “nomi shirami / uma no shitosuru /makura moto (fleas, lice / a horse peeing / by my pillow).” It is said that because of the strong winds and heavy rain during the rainy season, Basho and Sora had no choice but to stay in this house for three days and two nights, until the 17th. Copyright c Naruko Spa Tourist Association All Rights Reserved.